The sole protagonist of the piece is the Sistine Chapel itself. Visitors are guided through the history of the creation of Michelangelo's masterpiece, from the granting by Pope Julius II of the commission for the frescos adorning the vault to the realization of The Last Judgement on the wall behind the altar. This is followed by a reenactment of a papal election. The 60-minute production ends with The Last Judgement being brought to life around the audience. Balich uses scenery and installations as well as 270º projections to tell the story, which is accompanied by an ambitious soundtrack in the production of which Balich collaborated with top artists such as Sting. The project also received vigorous support from Germany. 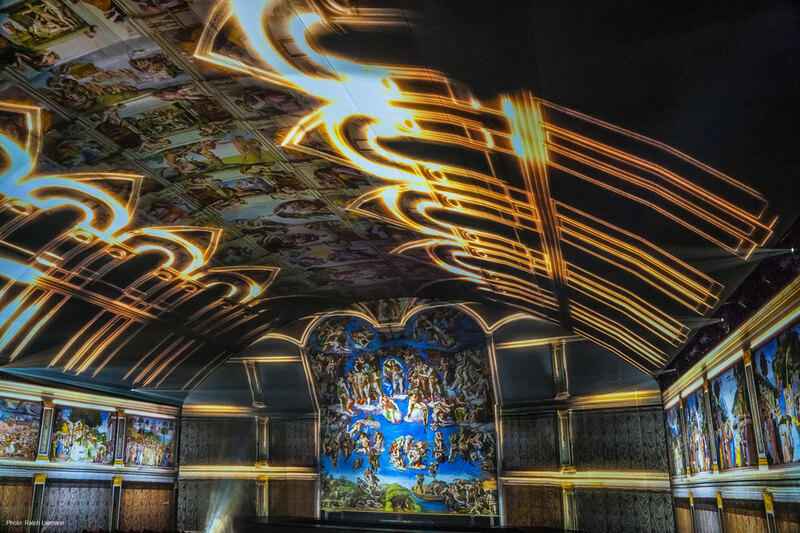 Acting on behalf of Marco Balich and the Vatican, Giandomenico Barbon, the technical director of Creative System, opted for a kinetic system from Movecat. Movecat Italy stepped in at short notice to partner the project and succeeded in assuring its timely execution despite the tight schedule and the diverse technical challenges. Among the objects to be moved and positioned were scenery, turntables and walls. Part of the challenge involved the integration of third-party products and encoders into the Movecat system. To control the system, Barbon chose the new Movecat Expert-T III system controller in conjunction with the Movecat I-Motion NMB-14 network master box. Among the other components used were Movecat V-Motion-30-E-SIL 3 and V-Motion-40-E-SIL3 variable motion power packs and Movecat CB-PMC-HV-P-C connector boxes, which were used to establish the connections to the external devices. The entire process of installing, adapting, configuring and commissioning the system was accomplished in Rome within twelve days under the direction of Jonathan Kruschel and Oliver Nachbauer from Movecat, whilst, to prepare them for the task ahead, the operators were trained to Super User Level at the Movecat Academy on the company's premises in Nufringen. The project "Giudizio Universale. Michelangelo and the Secrets of the Sistine Chapel" is Artainment's first production. The company, part of the Worldwide Shows Corporation (wscorp.com), was founded specially for productions of this kind. "Having worked on numerous Olympic ceremonies all over the world and ephemeral productions of that kind, I am proud to have created in Giudizio Universale a long-term production and one that meets the strict academic requirements imposed by the Vatican Museums," states Marco Balich. The client is delighted by the new attraction. "The Vatican Museums are forever negotiating a fraught path between tradition and innovation, in search of the perfect synthesis of the two extremes," explains Barbara Jatta, Director of the Vatican Museums. "This is essential to the proper functioning of an institution that welcomes more than six million visitors a year and is willing to embrace new forms of communication. It is in this context that the collaboration between the Vatican Museums and Artainment must be seen and judged." Among the devices used were D8 1t and 2t chain hoists, D8+ 0.5t and 1t chain hoists as well as a larger number of the new VKM-S II 250 chain hoists from the kinetic specialists fromNufringen. The single-fall VKM-S motors are remarkable for their exceptionally flexible handling as well as an innovative feature set that meets the highest safety standards. The control of the D8 and D8+ hoists is implemented using R-series RMC radio motion remote controls. These wireless remote controls operate in the 2.4 GHz frequency band and, depending upon the model,are capable of controlling four, eight or twelve D8/D8+ motors. For the VMK-S system control, an I-Motion Expert-T II system controller is used. This system makes the safe and user-friendly management of complex kinetic applications with up to 240 drivespossible, allowing D8, D8+ and C1 fixed or variable-speed drivestobe supervised and controlled intuitively. Jan Kleinenbrands of the R-Project Group, the events technology engineer responsible for the kinetic equipment used on the tour,offers a cogent explanation for his decision to opt for Movecat material: "Admittedly, the 1t D8+ motors are very large in terms of pack dimensions and their unladen weight is considerable, but due to their single chains they are far easier to work with. After careful consideration we came to the conclusion that their advantagesvis-à-vis conventional dual-fall 1t D8+ hoists outweighed any suchdrawbacks. It is admittedly a more expensive solution, because the material cannot be stacked in the trucks and more helpers are needed on site, but the probability of errors is reduced considerably." The I-Motion system provides for additional safety during setting-up as well as operation runs thanks to its optimized user comfort. "The I-Motion is probably the best system controller around right now for touring applications," states Kleinenbrands. "On this tour, we load the electronics onto a dolly specially designed by Lleyendecker to my specifications, so all that's left hanging then in the raftersare the motors. This set-up is extremely convenient from the standpoint of cabling as well as being very easy to service. Furthermore, you can also suspend the VMK-S as a climbing hoist. That saves time and power in situations where high speeds are not called for." The Movecat RMC-R radio controllers also provide ideal visibility during lifting operations, asKleinenbrands explains: "When rigging sound reinforcement equipment in particular, you can move right back for a better view without having endlessly lengths of cables in the load path next to the stage." Its reliability, certification and handling, taken together, made an irrefutable case for the use of Movecat equipment on the tour. The "Laune der Natour" tour by the Düsseldorf punk rockers resumes this year as an open air and festival tour. To realize a production of such complexity, the Ehrlich Brothers have been relying this year upon chain hoist systems and controllers from Movecat. To replace in their entirety the kinetic systems previously used, Ehrlich Entertainment GmbH invested in Movecat's VMK-S chain hoists, V-Motion-E variable motion controllers and I-Motion Basic-C show controllers. The Movecat VMK-S chain hoists, which comply with BGV C1, DIN 56950:2012- 05 and EN 61508 SIL 3,are notable for their innovative technology and ultra-flexible handling whilst meeting the highest safety standards. Henceforth, Ehrlich Brothers productions will employ seven special versions of the VMK-S-1000 model as climbing hoists capable of lifting loads of up to 1,000 kg safely through distances up to 24 metres. In combination with the VMK-S chain hoists, the Ehrlich Brothers are relying on seven Movecat V-Motion-40-E-SIL3 variable motion controllers in their "E" configuration. Unlike the basic version, these are equipped withspecial integrated network and motor filters and a dual processor for scenic runs over people in mobile, decentralized operation as defined by SIL3-EN 61508. The I-Motion Basic-C II show controller functions as a compact system controller for the systemic control of kinetic drives. The intelligent controller console is equipped with an integrated 12" touchscreen, a key-based input unit, a user ID card reader, a speed ratio encoder and a drive lever with a "dead man" function, for the dynamic control of runs performed by up to 24 VMK-S chain hoists in conjunction with the V-Motion controllers. To ensure the smooth and safe operation of theirnewly acquired chain hoist systems, the Ehrlich Brothers' technicians attended a training course at the Movecat Academy. In the seminar, "Movecat I-Motion Operator Super User", participants are given comprehensive and certified training in the legal and technical fundamentals governing use of the Movecat I-Motion system;the syllabus covers not only the regulations and standards applicable, risk analysis and system configuration but also the structure of the hardware and setting up of components. For the nineteenth time, the venue selected was the Rotterdam Ahoy, one of the largest events and sports halls in Europe. The first show opened with a display of drumming virtuosity: the backbeat to "Radar Love" by Golden Earring. 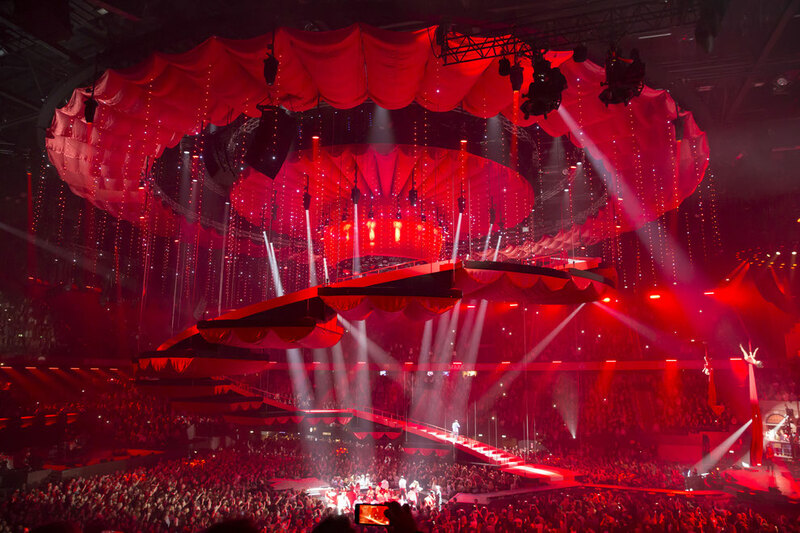 The group's drummer, Cesar Zuiderwijk, flew through the hall with a specially developed drum kit in a mixture of space capsule and chandelier – accompanied in flight by the drummers of the other acts taking part. This was only one of a number of kinetic effects – the total weight of the loads moved coming to some 38,000 kg – to draw enthusiastic applause. Others featured not only musicians and trapeze artists "flying" over the heads of the audience, numerous "floating" platforms employed as stages, and moving trusses carrying lighting and other scenic effects. The highlight was the spectacular transformation of a ring-shaped "UFO" with a diameter of 22 meters hovering at ceiling height into a gigantic spiral staircase with an eventual length of 70 metres along which a singer made his descent into the hall. The effects were realized by Frontline Rigging & Motion of the Netherlands using equipment from Movecat and eZ-Axis Automation Service and Rentals. Movecat supplied for the purpose eighty-four VMK-S 500-24 and eight VMW-S 1250-10 hoists, to which eZ-Axis contributed six eZ-Hoist Flying Performer Winches, four eZ-Trolleys and an eZ-Rotator. Ninety-two Movecat V-Motion 40E, six V-Motion 75E and five V-Motion 15E controllers were enlisted to cover the total of one hundred and three axes of movement involved. 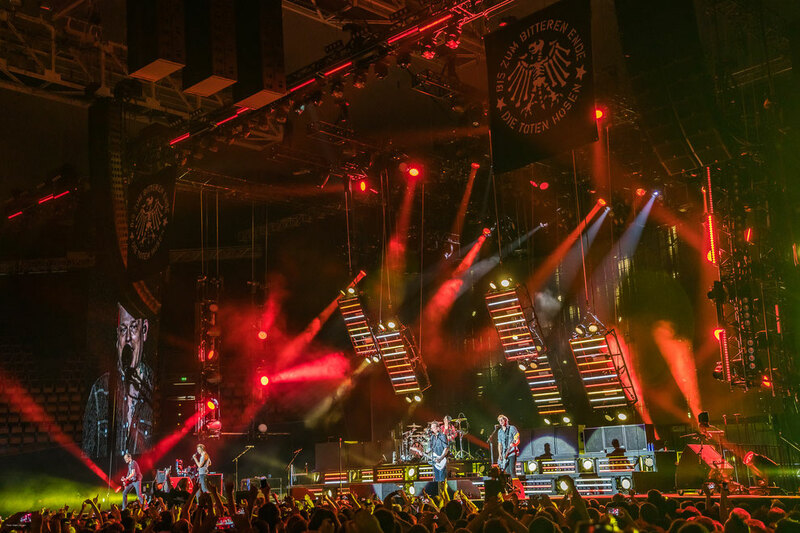 satis & fy Live Entertainment & Touring Support in Werne hat die Shows für die Scorpions realisiert und das Movecat Equipment aus Ihrem umfangreichen Mietpark bereitgestellt. 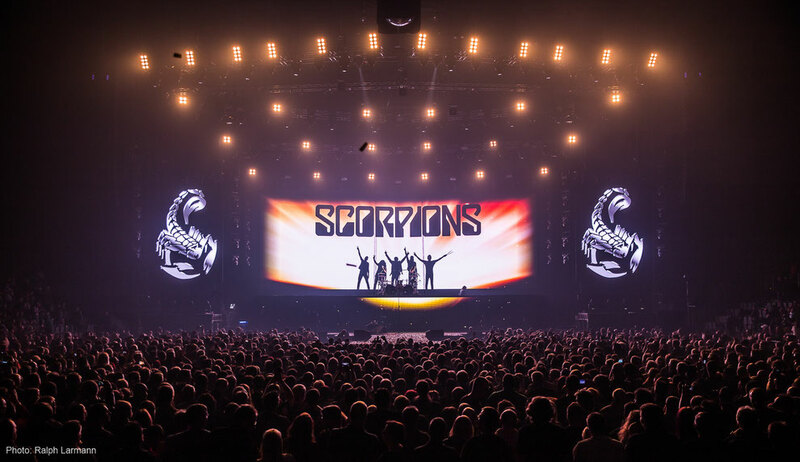 satis&fy Live Entertainment & Touring Support of Werne realised the shows for the Scorpions, drawing the Movecat equipment from its extensive rental inventory. "We are very satisfied with the material," comments Andreas Fiekers of satis&fy's Lighting & Rigging Department – Projects, "as it enabled us to cater optimally to the requirements of Scorpions productions in halls with capacities of around 10,000 seats. The material was used for the positioning of lighting and sound reinforcement equipment as well as the movement of lateral ladder trusses. At the Best of Events show, LLEYENDECKER was particularly concerned to demonstrate live the remarkable possibilities for interaction such equipment offers. At its disposal was a trade fair stand measuring 16 x 8 metres with a height of 6.5 metres.Extending for twelve metres in front of the back wall of the booth, which was itself covered with enormous LED screens, a Silent Move track was laid to allow the movement of a four-square-metre LED screen. The image content playing back on the two surfaces, the fixed LED screens at the back and the smaller LED screen passing in front of them, was kinetically synchronized.To implement the movement, LLEYENDECKER used six VMW-S 125 high-speed winches, an Expert-T controller, two NDB-6 network distributor boxes and a DMX trigger box—all from Movecat. The dynamically 'flown' 2 x 2-metre LED wall was moved horizontally and vertically across the face of the LED rear wall atop a specially constructed trolley and rotated through 30°.The Movecat controller not only provided real-time information to the media server on the current position of the trolley but served also to trigger additional effects via DMX 512.This proved the extent to which it is now possible to synchronize with split-second precision and pinpoint accuracy the movements and image content of mobile playback mediums with content playing back on static screens as well with accompanying lighting and special effects. In the process, the movement, image content and effects coalesce to form an organic whole.The triggering can be implemented bidirectionally, allowing for interaction with the artists and performers, as the kinetic movement and content can either follow the action onstage or vice versa.By this means, new and dynamically creative event solutions can be realised. 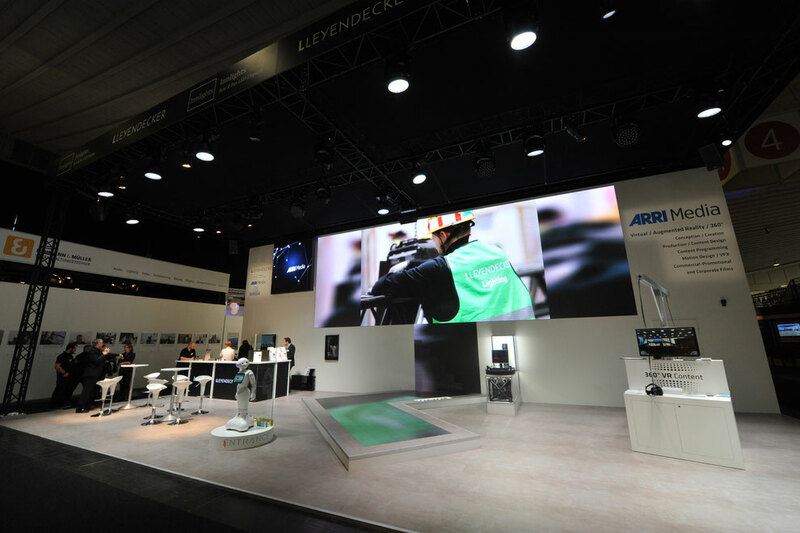 With its trade fair presentation, LLEYENDECKER demonstrated in particular its expertise when it comes to harnessing and integrating disparate elements to implement an overall event concept in a manner that is at once technically convincing and visually appealing.Numerous custom components were designed and manufactured for the purpose, such as wire and tow-cable guides, runners, pulley-systems, a concealed equipment shaft and much else besides. A real eye-catcher was the spectacular 25-metre-high stage,featuringa three-dimensional set, installed by the Media Resource Group (MRG)—charged with the entire project management as well as the technical realization of the spectacle. Also contributing greatly to the success of the production was the internationally oriented show staging, in which Movecat played an important role, as it will again in the summer of 2017. No fewer than sixty Pluslite 500 kg D8+ and twenty Plus-C 250 kg D8+ hoists from Movecat were deployed by MRG for the occasion. These were accompanied by additional 750 kg D8+, 1.5t D8+ and 2t D8 hoists. Produced by Urbane Künste Ruhr as a contribution to the Ruhrtriennale 2016, the installation seeked to re-examine the everyday urban experience. The multimedia installation by the group "osa_office for subversive architecture" could be experienced on the premises of the steel-processing centre SAZ Dortmund. The "art trips" in a heather violet colouredwalk-on sculpture made of steel involved hoisting visitors almost to the roof of a factory building, where, hovering in the air, they became part of a sound and video performance. For the implementation, two VMK-S-250 dual chainfall hoists and four V-Motion 40 variable motion power packs – in each case from Movecat – were used. The controllers are equipped with three-position run-direction selector switches located directly on the front panel and an illuminated GO button.For the illumination of the EMERGENCY STOP button, the Movecat developers have opted for a function-based solution.The GO, EMERGENCY STOP and channel-selector buttons are accompanied by LED status indicators, which in the case of the EMERGENCY STOP button also provide information about errors and the battery charge level.For carrying comfort, each transmitter module comes with a belly strap. The receiver modules, functions and plugs are compatible with the existing MRC E-Series and capable therefore of combining with all MPC E- and I-Series controllers without restrictions.They also draw their power from the receiver modules, whilst the RMC transmitters are powered by a 7.2 V/500 mAh exchangeable storage battery with an extended temperature range. For maximum convenience, the remote controls can be employed in all countries within the European Community as well as Switzerland without any obligation to register or pay any fees.For clarification of the situation regarding trouble-free radio operation in other non EC countries, Movecat should be consulted.The devices comply with all current radio and safety guidelines and are suitable without restrictions for the control of lifting equipment. 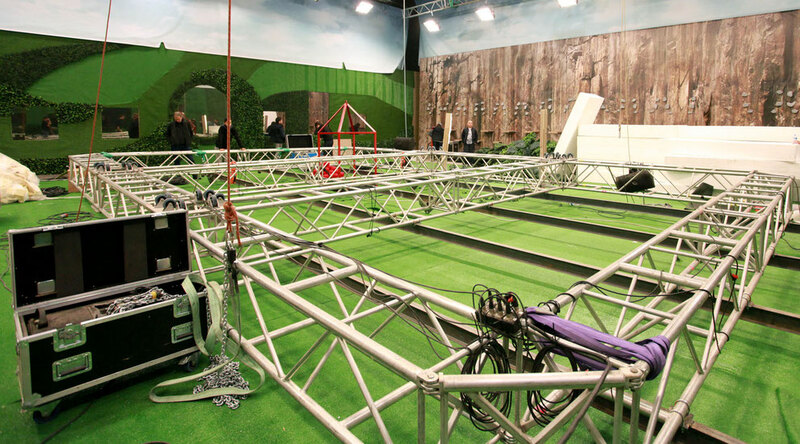 The apparatus for the game comprised four cable cars on rails attached to a 7 x 11 m moveable truss structure. Hanging from these, the candidates had to traverse the area repeatedly. For the vertical movement of the structure, including its sideways tilt, Benart relied upon a total of eight motor-powered VMK-S 500-24-24 chain hoists from Movecat, with eight V-Motion-40-E (SIL3) power packs in the rack for the supervision of all functions and run commands. Not only the VMD-S hoists but also the V-Motion Power Packs complywith the BGV C1 / DGUV V17 accident prevention regulations as well as safety integrity level (SIL) 3. Control of the eight chain hoists was provided by a Movecat I-Motion Expert-T II SIL3 system controller in accordance with BGV C1 and SIL 3. Between the control console and the V-Motion-40-E power packs, the team from Benart, which has taken over the exclusive distribution of Movecat products in Turkey, introduced two I-Motion NDB-6 network distribution boxesfrom Movecat for the closed i-Motion network. 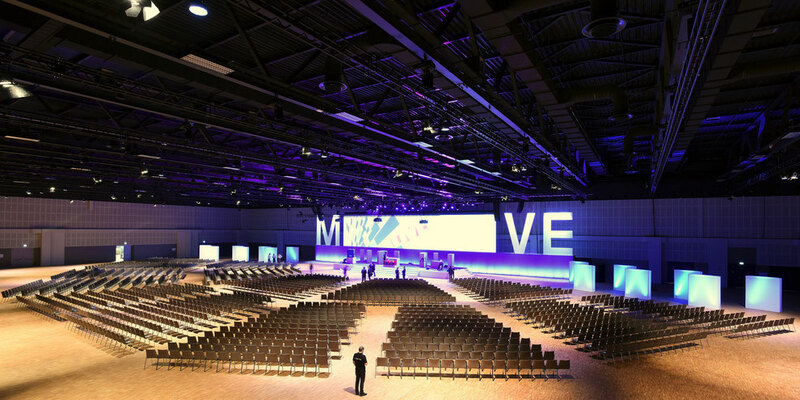 For a highly modern events area such as Convention Hall II, in terms of technical equipment, state-of-the-art material capable of satisfying the highest expectations was required: for this reason, the decision-makers opted for a kinetic system from Movecat. In all, ninety-six MovecatPluslite 1250 D8 Plus electric chain hoists with two-track operation limit switches including the X2 Option Kit that also in the case of 400 V direct drive hoists allows the determination of working limits without requiring addition control leads were installed beneath the ceiling of the new events hall. Twelve Movecat MPC 4ID8 High Power Controllers housed in a variety of system racks serve as the control platform for the system; high-performance PDU Power Stations provide the power for each rack, with these and all the cabling derived also from the Movecat product range. The kinetic solution from Movecat makes it possible to ‘fly’ loads of up to 1,250 kilograms from each of the ninety-six chain hoists beneath the hall’s self-supporting roof with its span of 75 metres. That is the equivalent attaching of a total load of 120 metric tons, or 100 automobiles, to the 11.5-metre ceiling of the hall. Impressive numbers that underline the future-readiness of the new events areas. Due to the potentially enormous loads, each hoist is supervised by an integrated LME load-measuring system. In connection with the MPC 4ID8 controllers, it is possible to prevent overload or underload conditions arising; moreover, the entire system is equipped with a digital buss system by means of which the load conditions and states of all hoists, individual load groups, and the total load can be supervised and documented in 24/7 mode on a laptop PC running Movecat’s AS-1 software. The entire system therefore complies with the current SQ P2 requirements for complex indeterminate load systems. For the project directed by Phase Event’s managing director, Ernst Sieber, a large amount of equipment from Movecat was used: forty-six D8 Plus 500 kg motors and four D8Plus 1000 kg motors—each with a lifting height of 24 metres—and the corresponding controllers. Phase Event brought a great deal of other material to the event as well, such as 120 moving lights, featuring models such as the Martin Mac III, Robe Wash 800, Robe Robin 600 Spot and Clay PakySharpy, 550-metres of trussing and a giant 35x12-metre video projection. Four 30-ton articulated lorries were required to transport the equipment to Munich and a team of forty-three technicians, riggers and assistants ensured that Barbara Clear was not only clearly visible but clearly audible too. Movecat sets "The Voice of Germany in motion"
The Voice of Germany is a German casting show that has been running annually since November 2011 on two channels: ProSieben and SAT.1. 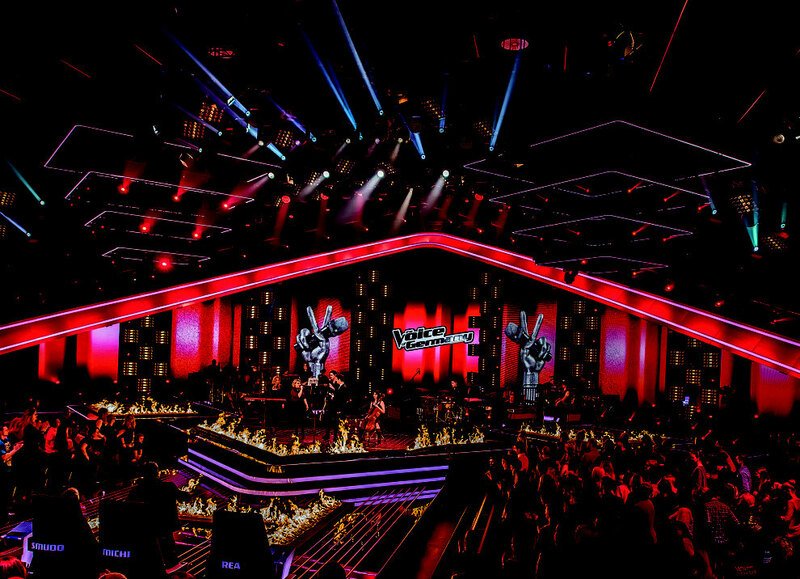 It is based on The Voice format inaugurated in the Netherlands at the end of 2010 with a show entitled The Voice of Holland. From its first season onwards, the production has been one of the most watched shows on ProSieben and SAT.1. Responsible for the set, lighting design and technical implementation of the final production were, respectively, stage architect Per-Arne Jansen of Wieder Design, Manuel da Costa and Guido Wydra of Stage Kinetik. One of the highlights of the stage set was a series of motor-driven rectangular truss structures of different sizes to which both moving heads and LED lighting instruments from Schick-Schnack were attached. Four of these concentric truss rectangles were flown on each side of the stage. Around 20 different stage images as well as dynamic scene changes had been programmed for the structures and were implemented in the course of the show. For each of the mobile truss rectangles three hoists were provided, which, due to the different sizes of the structures, had to be capable of handling loads ranging from 150 to 300 kilograms. For the purpose, eighteen VMK-S 500-24 motors from Movecat were employed as well as two additional VMK-S 250-33 motors, also from Movecat, for the positioning of a motor-driven LED panel designed to effect modifications to the decoration and backline. The hoisting height within the studio came to around eleven metres. The launch of the new Golf 7 left a lasting impression on the 13,500 Volkswagen dealers from over 30 different countries that had gathered to witness the presentation in the city of Zaragoza in northern Spain. The challenges involved were not simply the distance to be travelled and the not inconsiderable weight of the platform (around 1.5 tons) but also ensuring the safety of all involved. For this reason, Limelight opted for high-tech equipment from Movecat. Seven VMK-S hoists governed by V-Motion and I-Motion Basic-S controllers were employed. In view of the enormous hoisting height, the VMK-S-500 hoists were fitted with 42-metre chains. Five hoists effected problem- and vibration-free movement of the DJ cockpit, whilst two more shadowed the movement of the cockpit with a mirror ball. As a screen against the resulting dust, the client installed a dust protection cabin made from prefabricated tarpaulins that encompassed the entire stage area as well as the machine rigging. 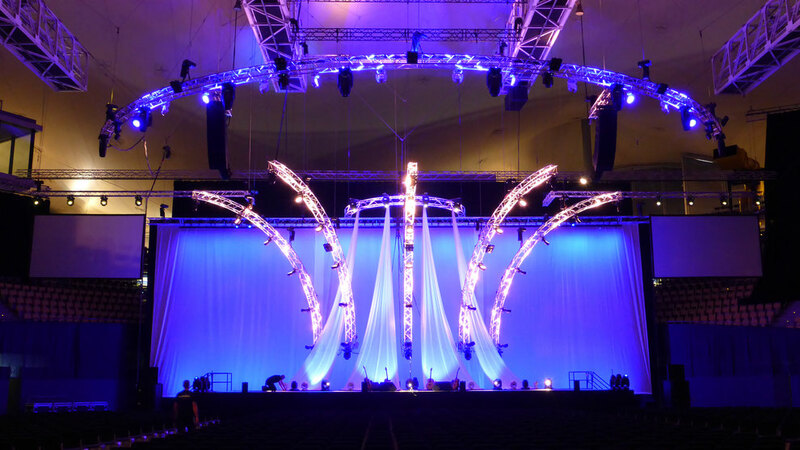 For the realization of this sophisticated design, the organizers relied upon professional kinetic solutions from Movecat. For the project, two lengths of 50mm and 60mm four-point trussing served initially as a pre-rig. These were suspended from three new stock bridges as well as one of the hall’s old crane bridges. To complement the bridges, two additional lengths of 100mm heavy duty four-point trussing had to be placed on the crane tracks. Two 30mm four-point trusses in each case ten metres long consolidated the integrity of the structure where the bridging trusses met the existing bridges. The ten points of attachment of the lengths of pre-rigging to the stock bridges were realized with the help of 40mm four-point trusses in each case one or two metres long. These were simply placed on the existing main girders of the bridges. The twenty-four Movecat Pluslite 1000-4 motorized chain hoists, each with a safe working load of 1t and complying with the D+ standard, were deployed as ceiling hoists in the pre-rigging stretches, to which six small-scale truss grids composed of 40mm four-point trusses were firmly attached. For the mounting of the protective tarpaulins, curtain rails and luminaires, on each side of the stage area five D8+ Pluslite 500-4 hoists with safe working loads of 0.5t were mounted on 24metre lengths of 40mm four-point trussing. These electric chain hoists were fixed to existing suspension points beneath the work galleries. In front of and behind the machine area, additional ten- to eleven-metre lengths of 30mm and 40mm trussing were attached — in some cases to D8+ chain hoists. 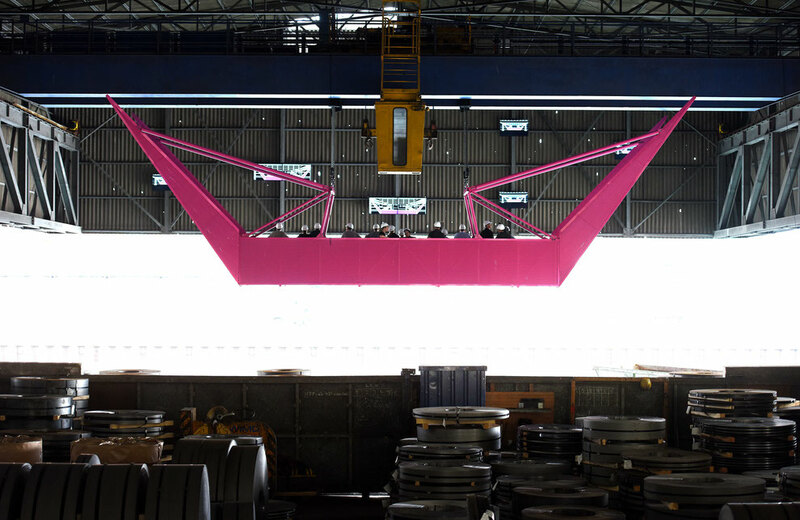 For the implementation of the foil framework, the organizers constructed a truss frame 10.4 metres high and 6.4 metres wide composed of 30mm four-edge elements. These accommodated the clear foil prior to its being lifted into place by ancillary motors. The twenty-four D8+ 1t Movecat hoists were equipped with Movecat LMS-M load-measuring cells connected to LMS LC8B controllers to provide the desired visualization and safety monitoring of the loads. Recently, the systems were employed in the production of Glasperlenspiel (‘The Glass Bead Game’) based on the novel by Hermann Hesse, the latest of a number of adaptations of novels that director Martin Nimz has brought to the stage in Karlsruhe. Together with author and dramatist Konstantin Küspert, Nimz condensed here Hesse’s 900-page masterpiece into a theatrical production in which the dramatic narrative was scarcely more remarkable than the installation, stage designer Sebastian Hannak having transformed the ‘little house’ in Karlsruhe for the production into a surreal funnel into which actors and audience alike experienced the sensation of being sucked into the stage. The Badische Staatstheater Karlsruhe is a multi-genre theatre in which opera, ballet and plays are performed. It is also home to the Jungen Staatstheater, which was founded in 2011. The Badische Staatskapelle (orchestra) and the Badische Staatsopernchor (opera chorus) are also attached to the theatre. 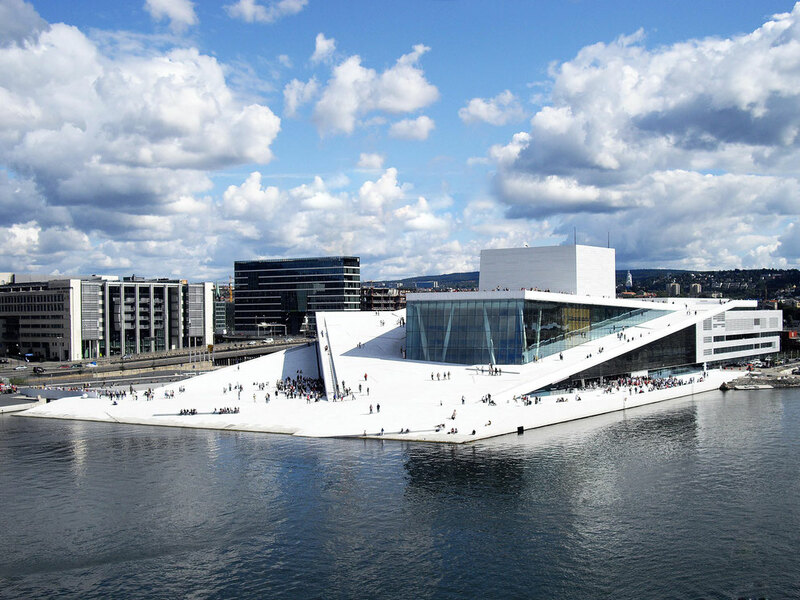 Among other things, the theatre is the principal venue for the annual Händel Festival and the Opera Ball, which takes place each year in May. Every two years, the state theatre participates in the organization of the European Day of Culture. Each of the twelve chain hoist systems installed in the Badische Staatstheater in Karlsruhe is capable of lifting loads of up to 250 kg safely at speeds of up to 4 m/min to a maximum height of 12 metres. Each of the three MPC 4IC1 devices can control up to four separate hoists. Direct control of all four axes is assured by input keys and encoders. The hoists are also equipped with incremental encoders and the fully-dynamic LME load measuring system. In combination with the MPC 4IC1 controllers, both targeted and group runs are possible with real-time load monitoring even in the case of complex, indeterminate load systems. Direct integration into the I-Motion network is possible. All components comply with the legal guidelines as well as the BGV-C1 and DIN 56950-01:2012-05 standards. Twenty-two months in the construction, Berlin’s CityCube—the German capital’s latest events, trade fair and congress venue—opened at the beginning of May. “The CityCube gives fresh impetus to Berlin’s ongoing development as an international trade fair and convention destination,” said the city’s mayor, Klaus Wowereit, during the opening ceremony. Of decisive importance to the decision in favour of Movecat equipment were the stringent requirements concerning flexibility, performance, safety and economic efficiency set out in the tender. In close cooperation with the clients and technicians of CityCube, an integral solution perfectly tailored to the requirements could be developed which, thanks to its modular structure, can be expanded at any time. CityCube Berlin is immediately adjacent to the South Entrance to Berlin’s ExpoCenter City, which is near the Radio Tower. With two main floors, a flexible system of partitions for the creation of up to eight events halls with capacities ranging from 400 to 3,000 participants, a bright, twelve-metre-high, column-free hall for large events and exhibitions on the upper floor and a variety of meeting rooms for between 50 to 300 guests each, plus the trade fairground nearby, the ideal conditions are in place for the hosting of events, conventions and trade fairs. 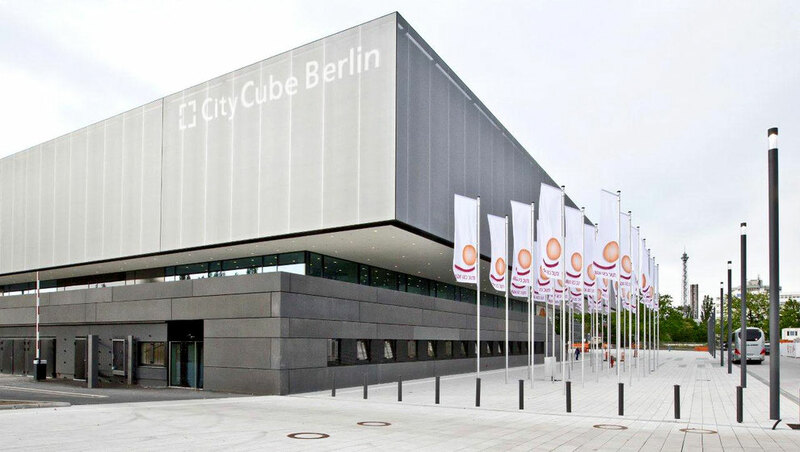 In fact, CityCube Berlin is capable of hosting events with up to 11,000 participants. 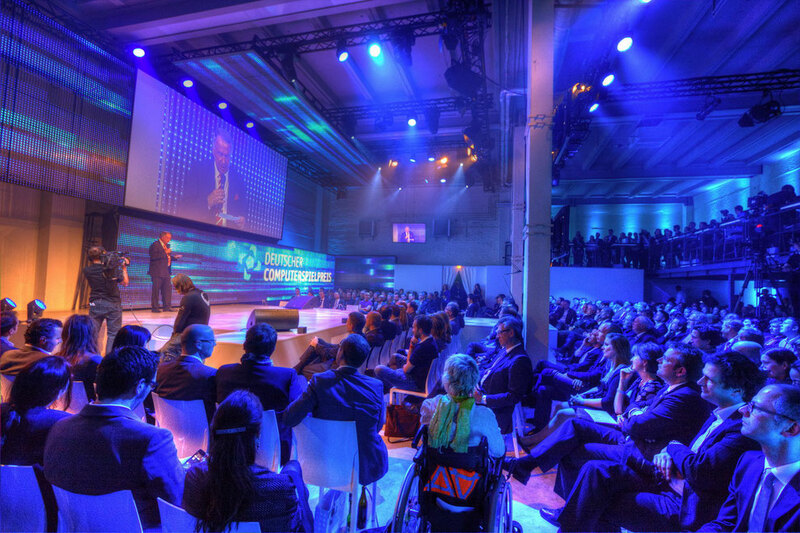 The first events staged in the CityCube Berlin were the Federal Congress of German Trade Unions (DGB) followed by the World Congress of International Trade Unions (ITUC)—both of which were implemented with the help of Movecat equipment. For some years now, the final of the Eurovision Song Contest has been regarded by the European TV industry as “the” show event of the year. In some respects, though, the 2013 edition of the competition, the 58th, actually took the contest to new heights. 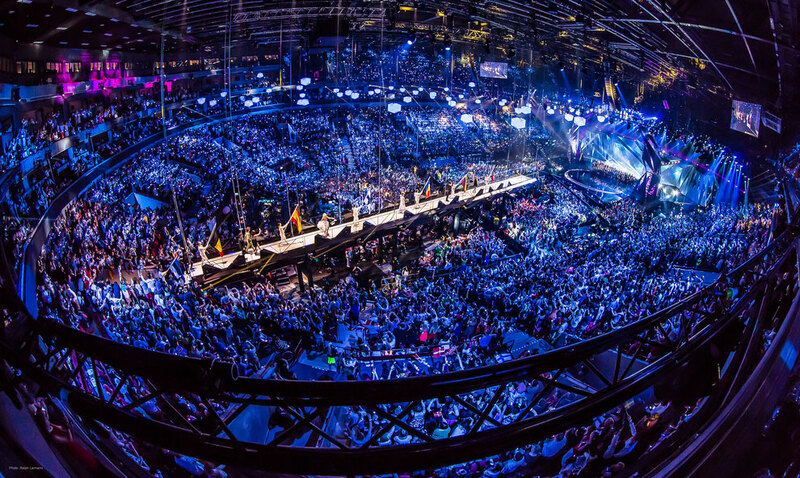 The victory in the final of the Danish singer Emmelie de Forest with the song “Only Teardrops” was witnessed by an audience of 11,000 in the sold-out Malmö Arena, with multi-million-strong army of TV viewers following the event throughout the continent from the comfort of their living rooms. 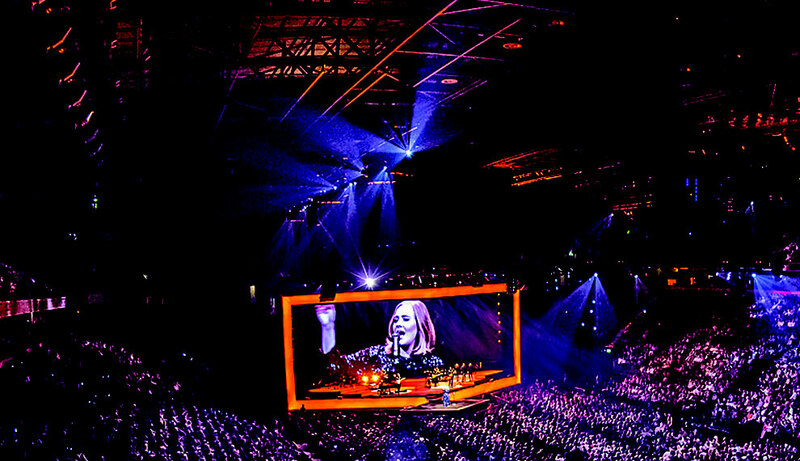 One of the central ideas of the show designer had been to bring the performers and audience closer together – no easy task with a production on this scale, given that the main stage alone extended over 220 square metres and that the 43 x 8-metre screen was being plied with images from 28 different HD video projectors! More than 800 lighting fixtures of various kinds were also being used to present the 39 acts making up the main programme in the most favourable possible light. The key to this technical triumph was the perfect synchronicity exhibited by the movement of a bridge weighing fully ten tons! This is where Movecat – with exactly the right equipment at its disposal, and the experience and expertise to make it count – played a decisive role. Twenty-two VMK-S 500-24 chain hoists from Movecat were used to position the bridge with perfect timing and accuracy – and, naturally, the very highest safety standards according to BGV C1 and SIL 3/EN 61508 were observed at all times. 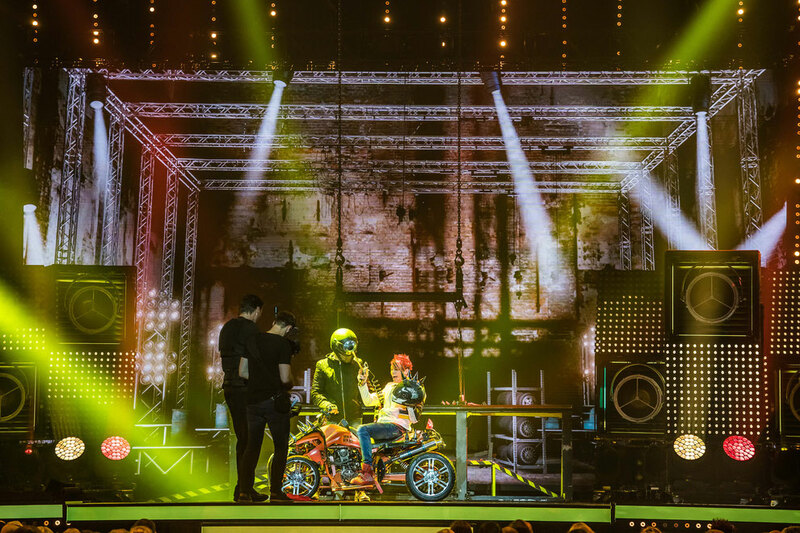 The final of the Eurovision Song Contest featured even more kinetic equipment from Movecat – a further key contribution to the success of the production. Twenty-four Movecat chain hoists, VMK-S 500-24 being again the model chosen, were used to manoeuvre dynamic show elements, two hoists being assigned to each of the twelve lighting trusses. The total weight of each truss was 500 kilograms. The repositioning of the trusses occurred sometimes on, sometimes off, camera. A further six chain hoists assumed responsibility for the movement of two more heavily laden lighting trusses – in this case weighing 650 kilograms each. Another six chain hoists from Movecat were used for the V-shaped decorative elements in the background to the stage. Depending upon their position, these movable decorations either blocked, or allowed to pass, the light from the lamps mounted behind the stage to allow for greater variety in the way the performers were illuminated. “Naturally, an event of this magnitude, followed by millions of viewers throughout Europe, makes considerable demands in terms of the quality of the equipment used, as well as of the safety of performers and spectators,” comments Andrew Abele of Movecat. 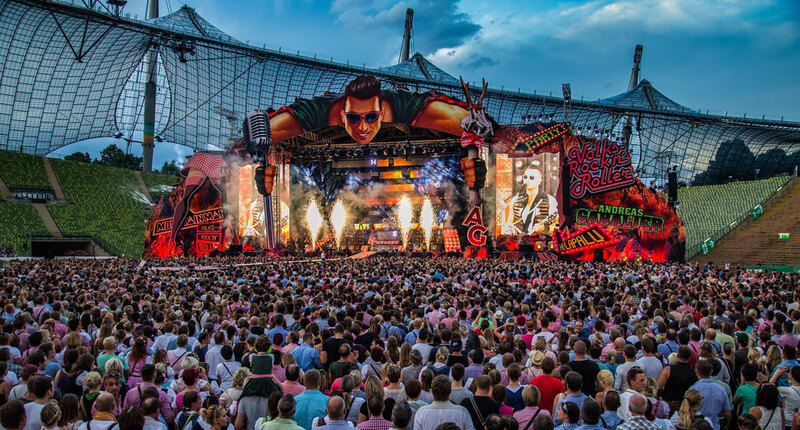 “We were delighted, therefore, when the decision makers elected to use our BGV C1/SIL 3 kinetic equipment.” The Movecat equipment used was supplied by the German Movecat Network partner Stage Kinetic of Castrop-Rauxel, who also provided support throughout the event. The electrical substation in Alexanderplatz built in 1960 was once East Berlin‘s principal source of energy. 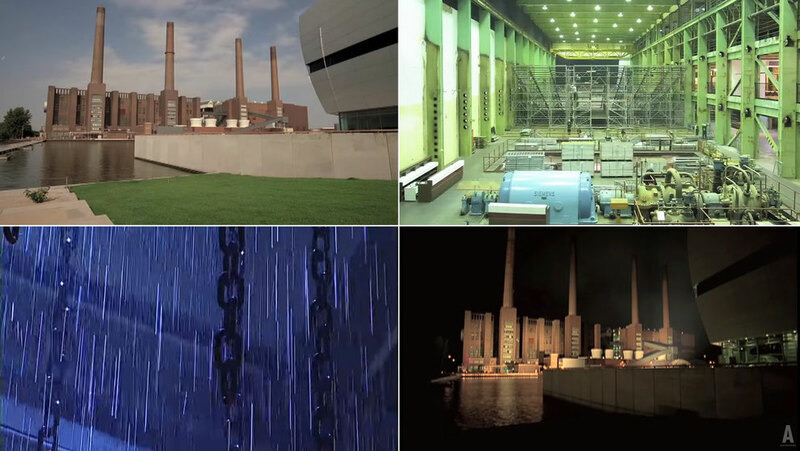 Even after German reunification in 1989, it continued to be used to generate electricity and was only shut down in 2002. The venue was fitted with media equipment by Movecat partner ambion, the installation featuring inter alia a total of sixteen Movecat Plus-C 250-4 D8 Plus chain hoists with incremental encoders and the new LME load measuring eyelets in dual chainfall operation with safe working loads of 500 kgper drive. The use of the fully integrated load measurementeyelets permits precise evaluation of load conditions even in the case of statically indeterminate systems and does so without the loss of installation height that is often the bugbear of external solutions. In conjunction with MPC 4ID8-I digital motor controllers, the igvw SQ P2 standard in terms of safety is fully complied with, and in terms of performance surpassed, even, by a considerable margin through programmed target runsand supervision of the run direction and speed. Swift changeovers and 100% reproducibilityare therefore possible even under frequently changing spatial and technical constraints. „As a long-time partner of Movecat, we believe not only in the safety and quality of the system but also in the standard of service,“ comments Oliver Jonekeit of ambion. The Movimentos Festival at the VW Autostadt in Wolfsburg underlines the auto manufacturer‘s commitment to art and culture. Last spring, the festival once again delighted lovers of dance and music with a varied and innovative programme that reconciled rock, pop, jazz and classical music and featured 52 international renowned acts. The combined audience over the four weeks the event lasted came to over 30,000. Among the highlights of the 2013 Movimentos Festival were performances by the Kibbutz Contemporary Dance Company, Company Jant-Bi Jigeen, José Montalvo and Rammstein. These involved scenic runs in which up to fifty VMK S 500-24 bGV c1/SiL 3 chain hoistsand twelve VMW-S 125-3entertainment winches were used simultaneously. The drives were controlled and monitored by two Expert-T II consoles and numerous NDBs via an I-Motion network. The organisers of the festival had requested an integrated complete system for all drives compliant with BGV C1 and SIL 3, and the system supplied by Movecat i-Motion partner Leyendecker of Wuppertalsatisfied in full their expectations not only in terms of safety but also on an artistic level. As a result, despite a programme that changed daily, the many and varied technical challenges posed in the course of the month-long festival were safely overcome. 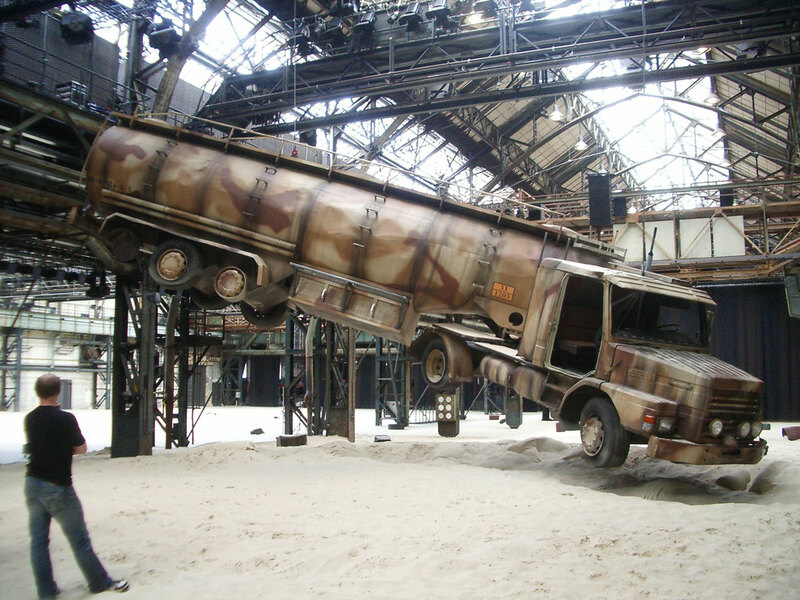 During that of Faust XXL, they were used on stage to manoeuvre personnel carriages. Now two further hoists have been added to the Festival inventory, this time installed in the fly loft of the renovated Felsenreitschule theatre, where their primary task is to lift lighting fixtures. What is spectacular about the installation here is the way the theatre‘s mobile telescopic roof supports have been coopted for the rigging, as the Felsenreitschule, which was built in 1963, has an open opera stage forty metres wide with a roof that can be partially or fully retracted. Between the 2010 and 2011 Summer Festivals, this retractable roof was renovated. Thanks to its modern design, the Festival has gained seven hundred square metres of additional space for equipment and rehearsal rooms. The new roof is made up of three mobile segments and can be retracted or extended in less than six minutes by five 8-metre telescopic arms. Rigging points on the telescopic girders for the Movecat chain hoists, improved protection against noise and heat, and two lighting bridges provide for optimum production conditions on stage. In 2012, this ingenious solution won recognition in the shape of architectural prize of the Federal State of Salzburg. For the show, a stage thirty-two metres in diameter was erected, backed by a sixty-metre-wide and eighteen-metre-high LED screen. The equipment was required for the elaborate scenic transformations on set. This was probably the largest mobile scenic BGV C1/SIL 3 kinetic system ever assembled, with up to ninety-two drives moving complex loads over people's heads. an entire system with a proven track record; a modular, service-friendly structure; redundant implementation of the essential components; a system with group and collision supervision; show-optimized programming of path- and time-synchronous group and object runs; show-optimized recall using cue buttons; and network functionality over extreme distances. The Esprit Arena was renamed the Düsseldorf Arena for the duration of the Eurovision Song Contest. The installation of the stage and events equipment took three weeks. The subsequent rehearsal marathon for the forty-three delegations, which completed a number of rehearsals and dress rehearsals in advance of the first show, took a further three weeks. Starting on the first of May, two work shifts were assigned to the show programming for the performances of the individual artists and the testing thereof. In all, the event involved forty tons of load being suspended, over six thousand movements, over sixty presets for a total of forty-three show segments for the individual countries, these being implemented by the programmers Jan Kleinenbrands, Guido Wydra, Niko Rösch and Jens Gerhardt. In each of the two semi-finals, nineteen nations were competing for a place in the final. The first semi-final of the international competition took place on the 10th May and the second semi-final on the 12th May. The final of the Eurovision Song Contest 2011 took place on the 14th May. The kinetic solutions offered by Movecat for the entertainment industry include electric chain hoists, controllers and accessories 'made in Germany' under strict observance of the latest standards and guidelines. These kinetic solutions are particularly prized wherever loads weighing tons have often to be moved over people's heads. Pope Benedikt XVI visited Freiburg on the 24th and 25th September. With its partner Megaforce of Weingarten, Movecat was able to realize even an event of this magnitude with complete success. 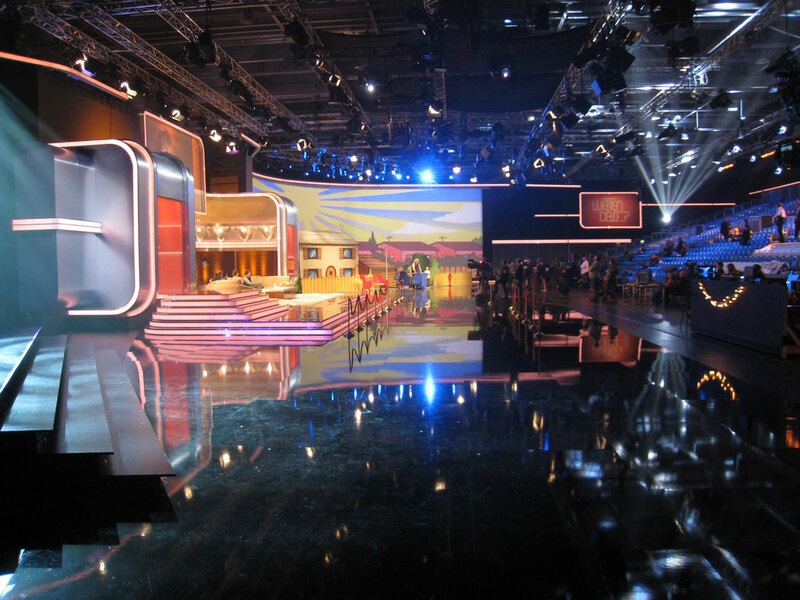 For the TVG-R stage with its circular roof, sixteen Movecat D8 PLUSlite 500 chain hoists were required – again with the corresponding MPC controller. In all, well over fifty Movecat hoists were used on stage to provide technical support for the stage, sound, lighting and media equipment. The Pope and his 33-man entourage spent around 105 hours in Germany, at a wide variety of venues, which called for swift setting-up and dismantling operations during which the strictest safety standards were observed at all times. 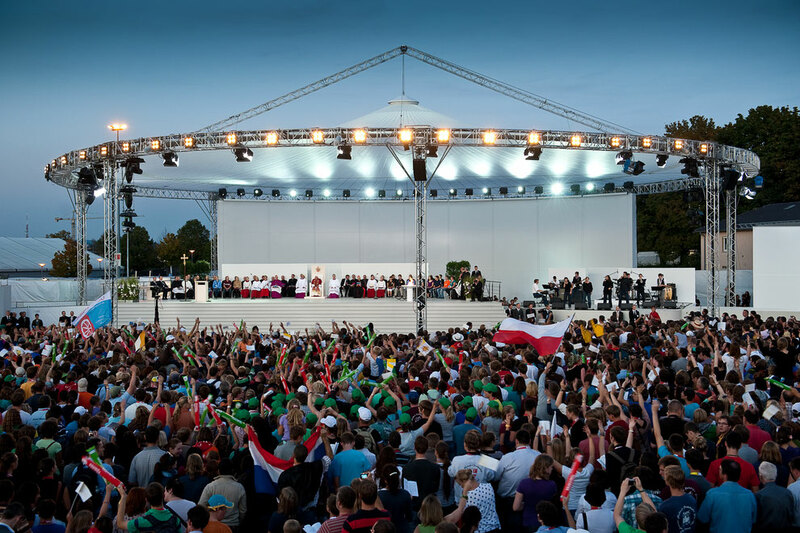 The modular and flexible system from Movecat made it possible for the crew to complete the requisite preparations for each Papal appearance punctually and securely. Here, too, the watchword was 'Safety First' - with the Pope's blessing! 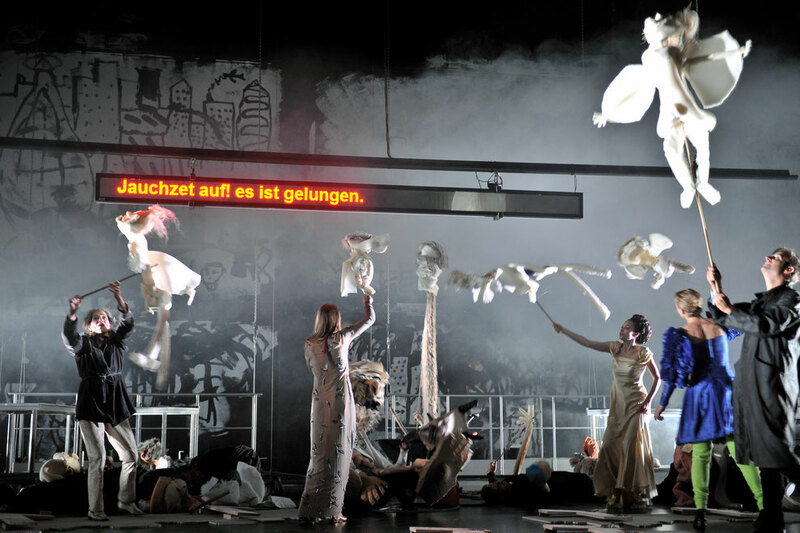 The Ruhr Triennial – an event spoken of by opera lovers in the same breath as the festivals in Bayreuth and Bregenz. The massive white platforms dominated the entire stage set. 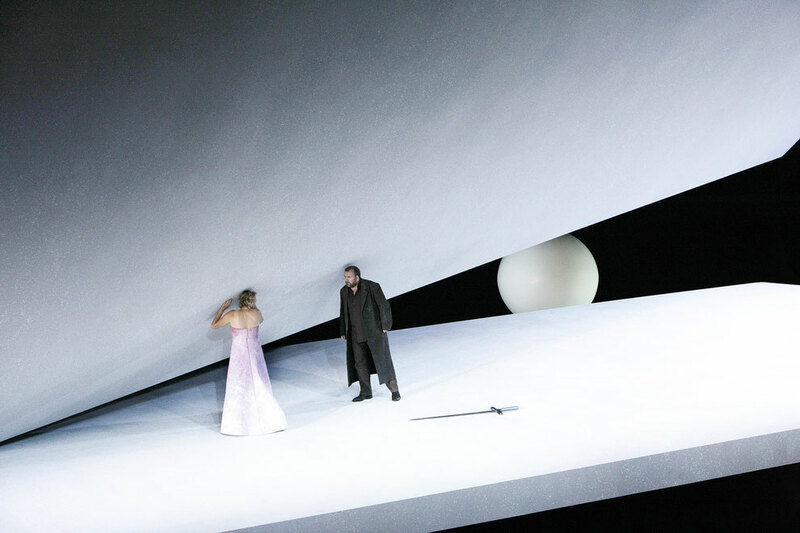 One formed the floor of the stage, which remained completely bare throughout the performance, whilst the other hovered, heavy and menacing, above it, with a giant white globe in the distance behind. The relative positions of the two white surfaces were constantly changing. 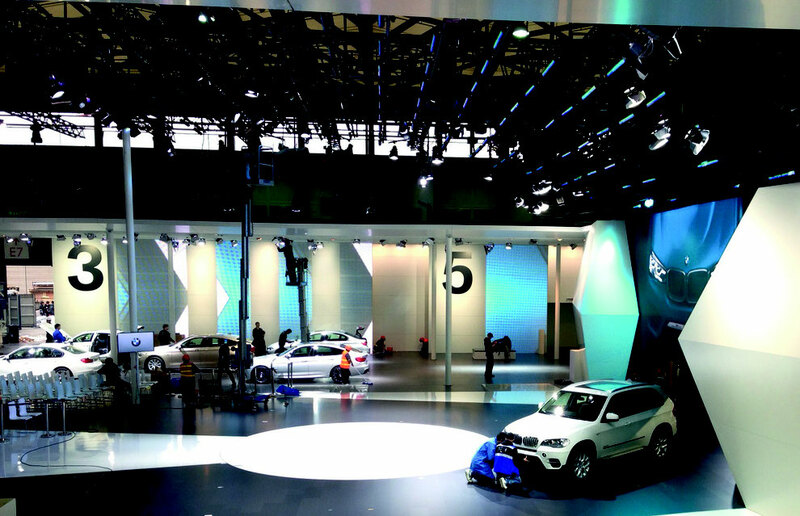 Invisible stage equipment from Movecat ensured that the floating platform could move in all directions, incline and even stand upright to form a wall, whilst the white globe served as a projection surface for videos. New perspectives were constantly on view, whilst the giant set seemed in its entirety to be floating in the void. All seven performances of Faust XXL on Perner Island in Hallein featured a mobile SIL 3 system. This comprised eight VMK-S 500-24 chain hoists in cases together with a Basic Show Controller from Movecat. The system, including four personnel carriages, was initially a fixed installation, but now that the Salzburg Festival is over, it is also possible to make unlimited mobile use of it. The opening of the Ruhr Triennial Festival 2010 in Bochum's Jahrhunderthalle featured a composition by Samir Odeh-Tamini entitled Leila und Madschnun. The lorry was suspended at the start beneath the roof, five metres up, and had to 'fall' from this height and then turn in the sand. Lie, hoist, fall, turn, hoist were the requirements. For the hoisting solution, the client opted for an SIL 3-certified Movecat system. The implementation involved a hoisting apparatus comprising two Movecat VMK-S 2500 kg hoists and a Basic controller provided by the enterprise Stage Kinetik, which since 2010 has numbered among the certified system users of Movecat SIL 3 I-Motion equipment. The equipment was then joined on site by a specially adjustable brake, a laser safety grid for the surveillance of the action surface, Movecat enabling keys and a heavy-duty Bumat turntable. Our I-Motion network partner opted for the Movecat I-Motion network system with sixteen VMK 500 chain hoists, V-Motions 30, NDB-6 and the SIL 3-certified Expert-T control system – not only because proven safety was a top priority with so many high-calibre stars involved but also because health and safety at work is always a key consideration especially in public service broadcasting productions. For the same reason, a BGV C1/SIL 3 certified Movecat system was used. In the state opera house, sixteen Movecat BGV-C1 hoists are used in the understage area mounted on four carriages to permit four-axis operation. This makes it possible to prepare scenery and scenic fittings in advance for use on the main stage as well as move them both horizontally and vertically in such a way as to position them accurately. For this, motorized trolleys combined a powerful controller are needed. The Movecat equipment offers in addition numerous functions and safety features such as dual-level speeds in both directions, dynamic gap supervision, selective group supervision, numerous connection points for the remote control, and practical supervision of all safety devices in a read-back chain with automatic evaluation. Chain hoists with their companion controllers are increasingly being used not only in theatres but elsewhere too in the service of culture, where they provide a modern alternative to winches. This is due, on the one hand, to the versatility of chain hoists and on the other to the fact that such solutions frequently prove to be more economical both to purchase and in service. For the implementation on the events ship, extremely compact dimensions, low unladen weight combined with high load-bearing capacity and the highest possible degree of universality were the key requirements of the overall system. For this reason, the BGV-C1 hoists were equipped with incremental encoders that allow exact and reproducible positioning of the individual hoists, thereby increasing safety through supervision of both the run direction and speed. Not long ago, a very young band from the small Swedish town of Borlänge took the rock 'n' roll world by storm. Mando Diao now rank among all-time great bands, this is beyond dispute, and no less certain is that their new album will further enhance their reputation. No two songs on the album are alike and yet they are all typically Mando Diao. The idea informing the design was the dynamic interaction of the music with the lighting effects, the video content and the scenic movement of the video elements. Important here were exact, synchronously controllable drives. Furthermore everything needed to be simple and yet explicitly reproducible without jeopardizing the safety of the performers. Notwithstanding these concerns, loads of almost two tons were moved in the course of the production. The contracting company selected Movecat VMK hoists for the purpose, since these are notable above all through their closed-loop functionality for their continuous speed control from 0 to 24 m/min with a full load. They also comply in full, naturally, with the stipulations of BGV C1 and SIL 3 regarding the movement of scenery over people's heads. "It's really great how quickly the runs can be programmed, recalled and adjusted," comments operator Jan Kleinenbrands. "We had two to three runs per song, directly over the stage and performers – all of them synchronized to the music, video and light. A really large number of scenic images such as steps, stairways, corners, wave runs and loops – all the console had to offer – was possible!" The special challenge here was the need for the cube to be manoeuvrable along the vertical axis as well as rotatable, as one half of it was furnished with 16,896 high-resolution LED video pixel elements and the other half with 18,000 rectangular mirrors. Because of the scenic requirement for 'overhead movement', a BGV C1/SIL 3 solution was required by the authorities. The contracting company responsible for the stage equipment opted here for a Movecat solution comprising three VMK-S 1000 units combined with an Expert-T controller. The results included breathtaking transformations and impressive stage sets that made a great and lasting impression. It is also worth noting that numerous Movecat D8 and D8 Plus hoists and controllers were being deployed at the same time by other technical partners of the overall production to move the lighting, sound and media equipment. Here, before any purchasing decisions were taken, extensive tests were invariably conducted, so it was especially gratifying to us that – in view of demanding technical requirements such as maximum speed in combination with continuous control in closed-loop mode, low noise emission, brakes with function supervision and full compliance with the BGV C1 and EN 61508 guidelines for integration into an SIL 3 system – the devices eventually chosen were VMK-S hoists from Movecat. And this without any modification of the standard configuration being needed! In all, forty-six VMK-S 500-24, VMK-S 800-6 and VMK-S 1250-10 hoists were delivered in combination with undercarriages. 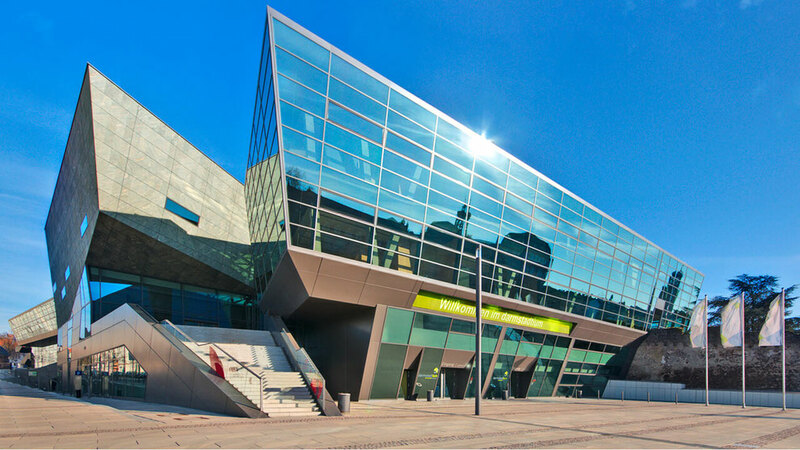 With its transparent and futuristic lines and central location, the Darmstadtium represents an attractive conference and convention venue. In view of the universality of the use portfolio and planned high exploitation rate of the rooms, the ability to meet tight transformation schedules and deliver precise reproducibility in the case of repeating productions are extremely important features of the venue. For the lifting gear, thirty-seven VMK-L BGV C1 hoists were selected with load-bearing capacities ranging from 500 to 1,250 kg, mounted on trolleys running on tracks to allow their flexible deployment in the various rooms. On the control side, these are integrated into the central stage control system to permit users to operate the entire understage and above stage machinery centrally by means of a single controller. The entire system complies with the BGV C1/EN 61508 standards and is approved in accordance with SIL 2 for complex setting-up operations with path- and time-synchronous groups.